It’s fun to let a recipe go “wrong” on purpose. Maiale al Latte is one of those dishes: pork braised in milk for hours, until the milk gives way to tender, nutty, herb flavored curds. Some will tell you this “curdled milk” is a mistake. I’m here to tell you what everyone in San Marino and Italy already know – this is homemade cheese ripe for the snacking, an epic byproduct of an already amazingly tender roast, soaked with sage and rosemary, garlic and bay leaves, milk and wine. 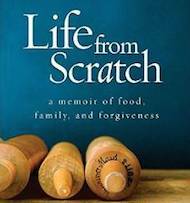 Once strained out of the sauce, I’ve read accounts of the curds being spread on toast. What a pleasure that would be. But let’s back up a moment. This isn’t about cheese. That’s just the cherry on top. 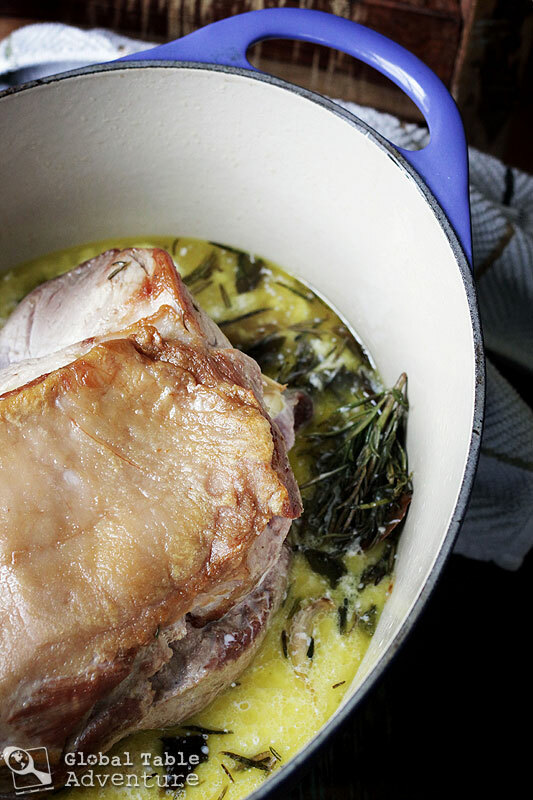 This is really about a braised, tender pork shoulder… fit for any gathering of happy friends. 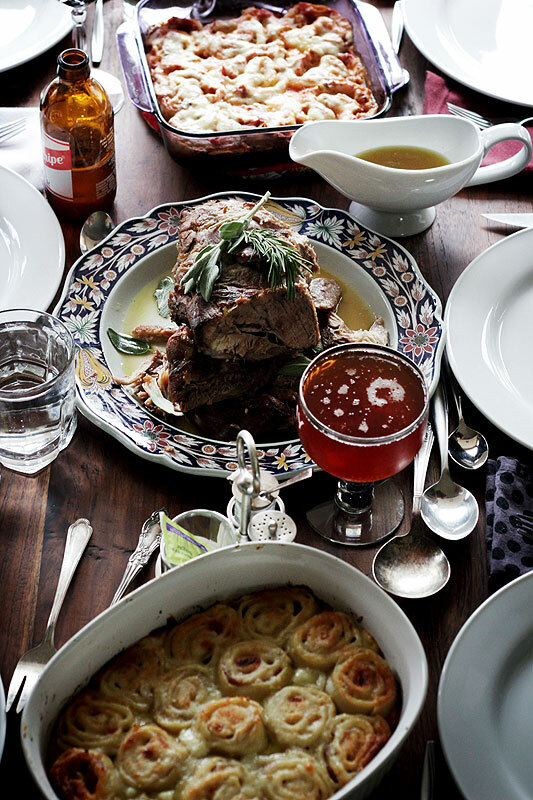 The Sanmarinese and Italians love milk-braised pork. And today, we’re about to see why. Preheat the oven to 350F. 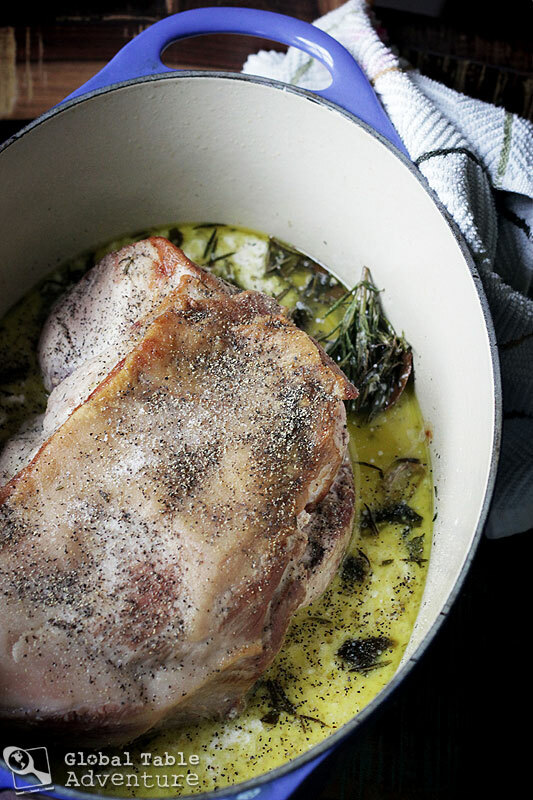 Meanwhile, on the stove top, lightly brown the pork in a dutch oven with plenty of good olive oil. This will take 5-8 minutes per side over medium-high. 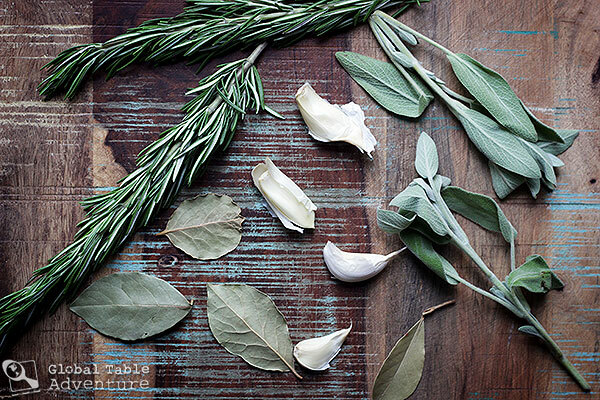 As you brown the last side, toss in the rosemary, sage, bay leaves, and several whole garlic cloves (unpeeled). Let them infuse the oil with their glory. Then, enjoy the glorious scent as you splash the white wine and milk into the bottom of the pot. Cover and pop in the oven. 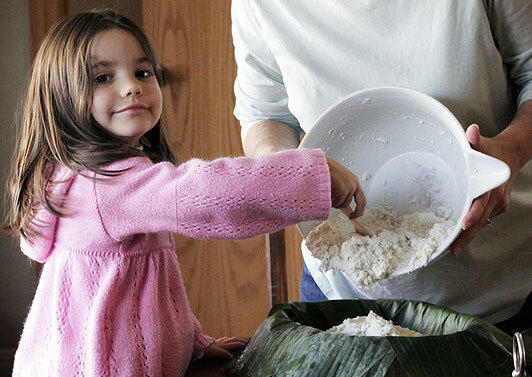 Bake, turning once or twice, for 2 1/2-3 hours, or until completely tender. The milk will form curds. 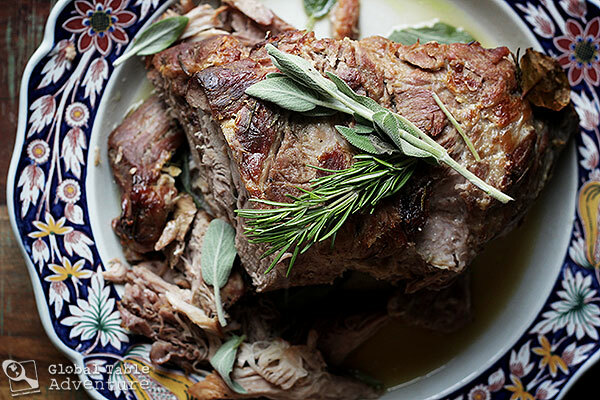 Strain the juices, skim off any fat, and serve on the side of the roast. Serve the curds separately, if desired. 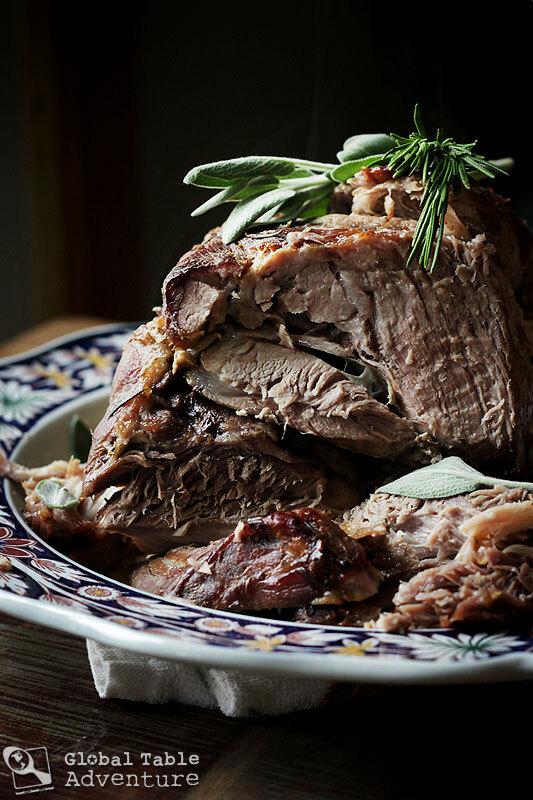 Be sure to decorate the roast with a few sprigs of rosemary and sage for color. The messier the better. No need to slice this one neatly, friends. Serve with Swallow’s Nest Pasta, a.k.a. Nidi Di Rondine. It’s fun to let a recipe go “wrong” on purpose. Maiale al Latte is one of those dishes: pork braised in milk for hours, until the milk gives way to tender, nutty, herb flavored curds. Some will tell you this “curdled milk” is a mistake. I’m here to tell you what everyone in San Marino and Italy already know – this is homemade cheese ripe for the snacking, an epic byproduct of an already amazingly tender roast, soaked with sage and rosemary, garlic and bay leaves, milk and wine.Outrageous.Once strained out of the sauce, I’ve read accounts of the curds being spread on toast. Splash the white wine and milk into the bottom of the pot. Season liberally with salt and pepper. 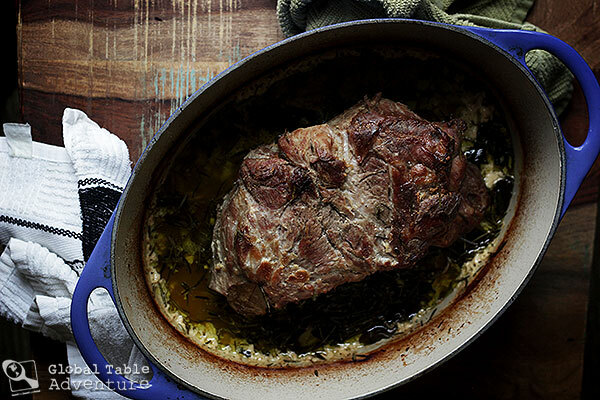 Strain the juices, skim off any fat, and serve on the side of the roast. Serve the curds separately, if desired. 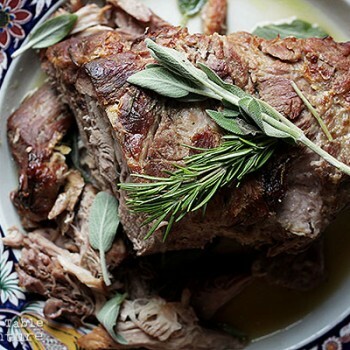 Be sure to decorate the roast with a few sprigs of rosemary and sage for color. Enjoy! Looks and sounds yummy as usual! Just curious….why do you not peel the garlic cloves? Oh my – that looks scrumptious! Oh, I just saw your comment! I hope it went well 🙂 I would have guessed not too much longer, as long as the roasts have room around them for heat to circulate. Some sources say about 45 minutes per pound, but since they are separate, I’d basically do 6×45 minutes. 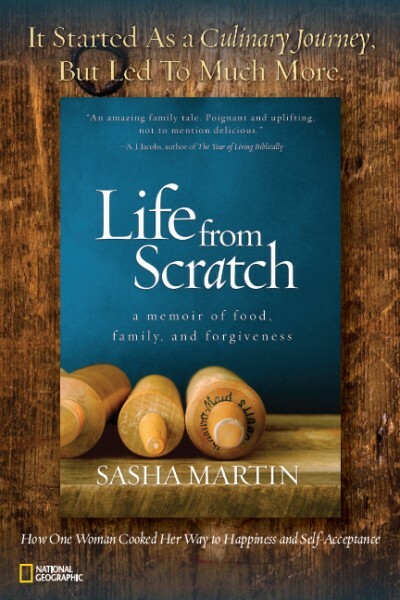 Sasha, it is SO long ago this beautiful recipe has been posted I think u may never see my question. But I will try anyway. 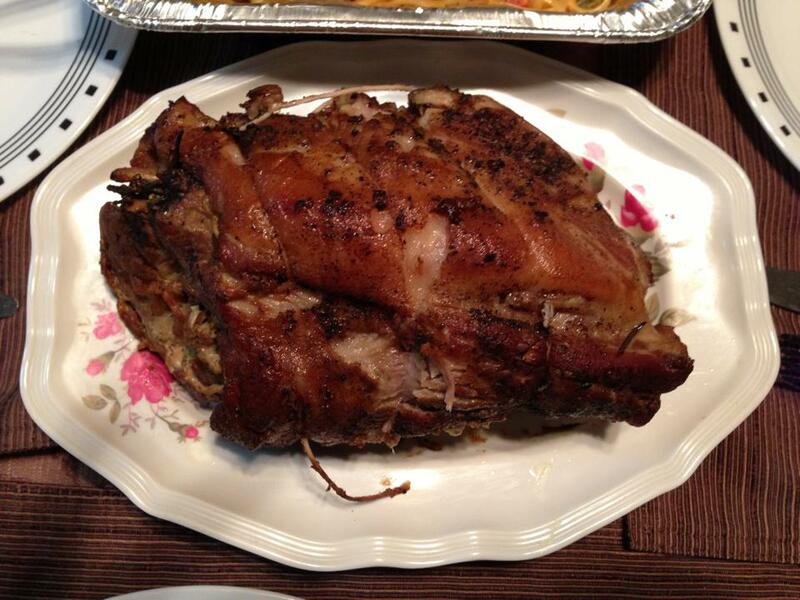 In the photo above of the (the bottom photo) what are the two side dishes above and below the pork roast? Is one of them the curds? Tomatoes with cheese? I hope u will see this. Thank you for the great job you do. I’ve used a similar recipe from the River Cafe in London that uses lemon rind instead of the wine to curdle the milk. Been a while since I’ve made that though, so this has been a good reminder!! Just made this and WOW!! Oh my gosh, it was so good!! I can’t believe how easy it was and how every bite was bursting with flavor. Definitely going to be making this on a regular basis! One of THE best dishes I have made in a long time. I have made it twice using my crock pot. My kids prefer it the next day in a roll for pulled pork sandwiches. Great dish to feed a crowd. day having to breathe in this most tantalizing aroma! Thank you for your revealing food odessey!